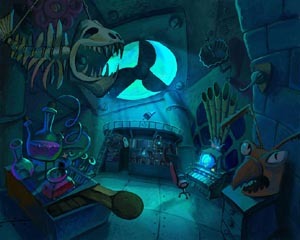 The film opens in an experimental lab. One scientist is giving another a tour of the place. Scientist 1: "I hope you found our facility easily." Scientist 2: "I just looked for the building with the picket line." Scientist 1: "NEMO! 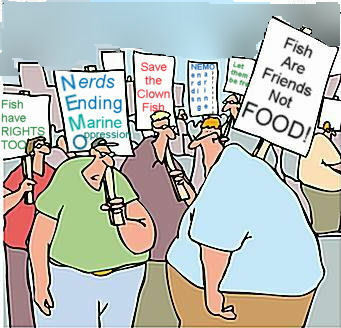 Nerds Ending Marine Oppression! Bunch of fish huggers! They don't understand that the experiments we do on fish may one day further mankind." "Like this little blue here, we've taught her how to communicate with 347 different species of fish and sea mammals, including whales." 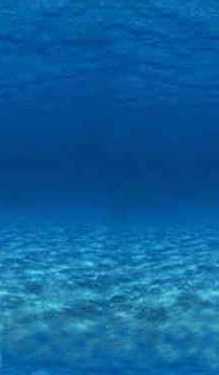 We see Dory in the tank with other fish. They are having a conversation. She's still our adorable Dory, but she's not as flighty. Scientist 2: "How will that help mankind?" Scientist 1: "We can use a fish like this for bait. We'll teach her how to tell the other fish to go towards our nets. Fish like this will help feed the world!" Scientist 2: "How will she know where to send the other fish?" Scientist 1: "With little signs. We've taught this fish how to read." We see a sign drop into the tank. 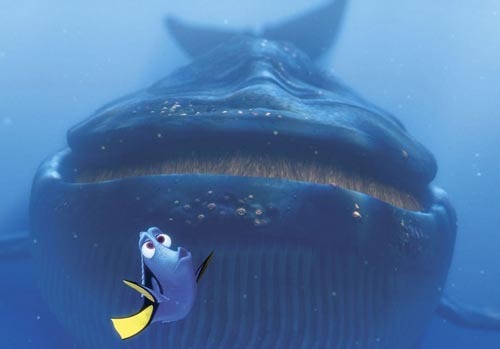 Dory says, "Oh look, Mr. Whale, this sign says 'Free Krill, This Way!' Follow me!"